Recently, Collective Spatial Keyword Querying (CoSKQ), which returns a group of objects that cover a set of given keywords collectively and have the smallest cost, has received extensive attention in spatial database community. However, no research so far focuses on a situation when the result of CoSKQ is taken as the input of a query. But this kind of query has many applications in location based services. In this paper, we introduce a new problem Reverse Collective Spatial Keyword Querying (RCoSKQ) that returns a region, in which the query objects are qualified objects with the highest spatial and textual similarity. We propose an efficient method which uses IR-tree to retrieve objects with text descriptions. 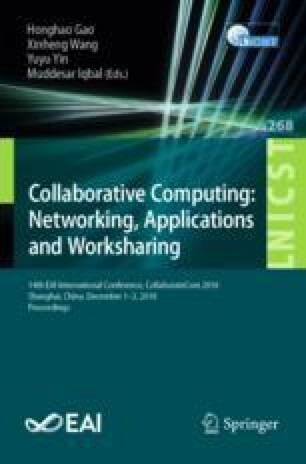 To accelerate the query process, a pruning method that effectively reduces computing is proposed. The experiments over real and synthesis data sets demonstrate the efficiency of our approaches. This work is supported by the National Natural Science Foundation of China (No. 61572165), the Natural Science Foundation of Zhejiang Province (No. LZ15F 020003).